We will be hosting our first general membership meeting on Friday, October 12, 5:30-7:30pm at Allen Neighborhood Center. 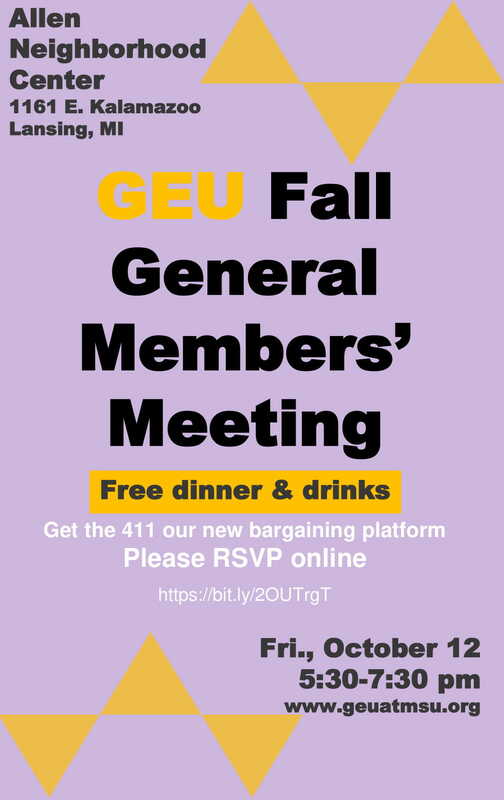 This is a really important meeting where members will be asked to give feedback on the issues we are planning to negotiate this spring when the contract expires. There will also be food and drinks. Families are welcome, and we can reimburse for child care needed to attend the meeting. Please RSVP here so we have a head count for food. As MSU publicly considers shifting the burden of the institution’s failures onto graduate and out of state students, please be aware that your GEU contract guarantees all grad students who are employed as Teaching Assistants pay tuition at the in-state rate. This means that anyone who is employed as a TA would be exempt from the out of state and international student increases the administration is currently considering. This is also why it’s so important that we work to expand our unit to include more graduate student employees. We all deserve access to the protections of a union contract. In a broader sense, it is profoundly unethical for the university to consider a tuition increase at this stage. People on campus absolutely should be speaking up. They can do this by calling the trustees and Engler, by talking to the deans of their colleges, and by writing letters to the editors of the State News, the LSJ, the Detroit Free Press, the Detroit News, and anywhere else that is covering this case. This was a failure in MSU’s athletics program, which is an entirely separate budget from the rest of university operations, and which should be the first place that MSU looks to draw this money. This was also a failure of the School of Osteopathic Medicine, the Office of General Counsel, the Office of Institutional Equity, and others. This was not a failure of MSU graduate, international, or out of state students. MSU carries liability insurance, which they are barely considering as an option here, and there is about $1 billion in slush in the endowment that could cover this. With all of these resources, to saddle students with the costs of an institution’s failures is not progress, but is just one more way MSU is demonstrating a failure to respond appropriately to this case. If MSU goes through with a tuition increase, the university will have financed the costs of willful and wanton neglect of duty by its leadership on the backs of individuals who have been victimized by that same leadership. Larry Nassar is by far the most prolific and perhaps the most brazen of abusers at MSU, but he is far from the only perpetrator this university harbors. The survivors of abuse by Larry Nassar deserve far more than this settlement provides them. The students of MSU deserve an administration that takes responsibility for the failures of the institution, rather than pushing that responsibility onto the backs of the students this institution should serve. MSU does not need to raise tuition to meet the terms of this settlement. The money is available in insurance, in the endowment, in the athletics program, and elsewhere. Students cannot afford to remain at a university that pretends otherwise.